(Des Moines) State Senator Nate Boulton, the ranking member of the Senate Labor and Business Committee, is sponsoring two bills to restore rights to working Iowans. 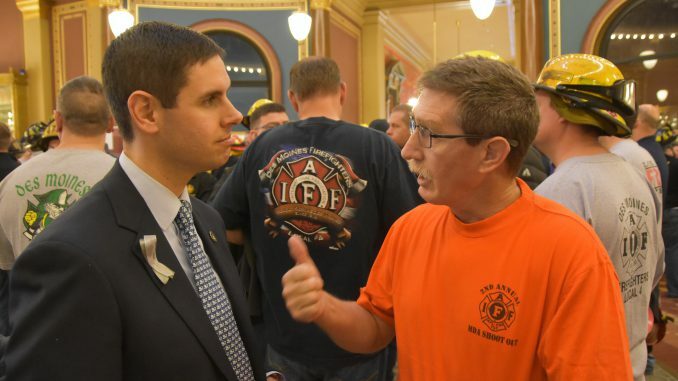 Senator Nate Boulton has proposed two bills, Senate File 2185 and Senate File 2186, to restore and improve the rights of Iowa workers. Senate File 2185 would allow injured Iowa employees to choose their own doctors. Senate File 2186 restores the collective bargaining rights abruptly taken away from several hundred thousand Iowa workers last year. These rights were first approved in the early 1970s by Republican Governor Robert Ray and a Republican-controlled state legislature. Since that legislation is more than 40 years old, Boulton’s legislation expands those rights so teachers can bargain issues such as class size, so police and firefighters can negotiate on issues like safety equipment and so all workers can negotiate on health insurance. Boulton said approving his proposed legislation would be the first two steps towards improving Iowa’s national image in a way that would help grow the state’s economy. For more information, contact Senator Boulton at 515-669-4259.